Much has been written about Mexico’s increasing popularity among US and even Asian companies seeking to reduce manufacturing costs. But European companies are also joining the trend of moving to Mexico to do manufacturing in Juarez or manufacturing in Tijuana as well as other locations throughout Mexico. And many believe this trend will continue for years to come. 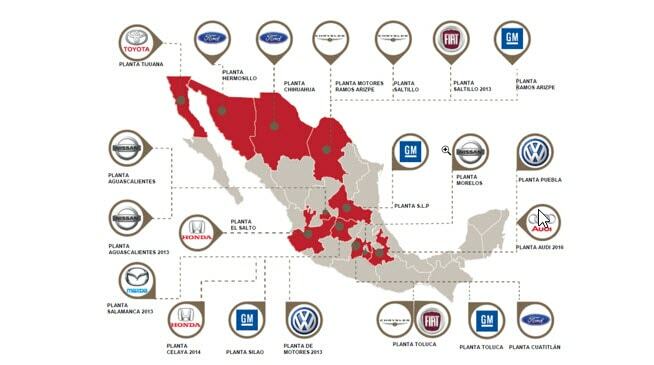 Not only are major automobile manufacturing companies bringing their business to Mexico but added to this trend is the movement of their parts and components suppliers. Many of these are seeking assistance from companies that provide Shelter Services such as are provided by the Tecma Group of Companies in Tijuana, Juarez, Mexicali, Durango, Torreon and other locations throughout Mexico. Shelter Services basically make the borders of Mexico ‘invisible’. A move to Mexico for a European company is no more complicated than moving from one part of their home to city to another part. Simple and profitable when using Shelter Services provided by proven experts. This summer, BMW made a major announcement regarding the manufacture of their next-generation 3-series sedan. Like several European car makers before them, the German company is opening a new manufacturing facility in Mexico. The only other BMW production plant in North America is in Spartanburg, South Carolina, but the company chose Mexico for this new facility due to a myriad of incentives, most notable of which is the Latin American country’s very low labor costs. The company’s South African plant will close once the new plant opens in San Luis Potosi, Mexico. The project represents a total investment of $1 billion and will produce luxury vehicles for export, 70% of which will be to North American markets. Among the benefits of moving to Mexico are the country’s numerous free trade agreements, highly skilled workers, proximity to large markets, and one of the lowest costs of labor in the world. Other prominent European car makers already operating in Mexico or planning new operations in the near future include Volkswagen, Audi, and Mercedes-Benz. Due to Mexico’s strong relationship with Europe as well as incentives inherent in Mexico’s economic structure, this overall trend of growing European manufacturing in Mexico will likely continue for years to come. China’s labor costs have risen dramatically while Mexico’s have remained low. Regardless of political changes that may come, the reforms Mexico has enacted in recent years have made a lasting impact on the country’s status as a manufacturing partner of choice for European companies and major manufacturers around the world. Mexico is now the 7th largest vehicle manufacturer in the world and one of the fastest growing export manufacturers overall in the global marketplace. Moving to Mexico to take advantage of these benefits makes the most sense for European manufacturers with an eye towards long-term growth.